Here, you'll be able to get news, information, schedules, rosters, game results, directions and much much more. Check back frequently for the latest information about our league. "The outcome of a game will never outlive the pride of belonging, the experience of playing, the friends and the fun. The essence of Little League is the people, their communities, and the everlasting bond between them." Huge thanks to Joe Leary for taking the time to captue and post 346 photos. The Oakton Cougar Baseball Camp is intended to teach players solid fundamental baseball skills. Our goal is to provide each player with the instruction, knowledge, and evaluation necessary to raise their level of play. Our instruction will emphasize the core values of Oakton Cougar Baseball: Excellence, Teamwork, and Integrity. 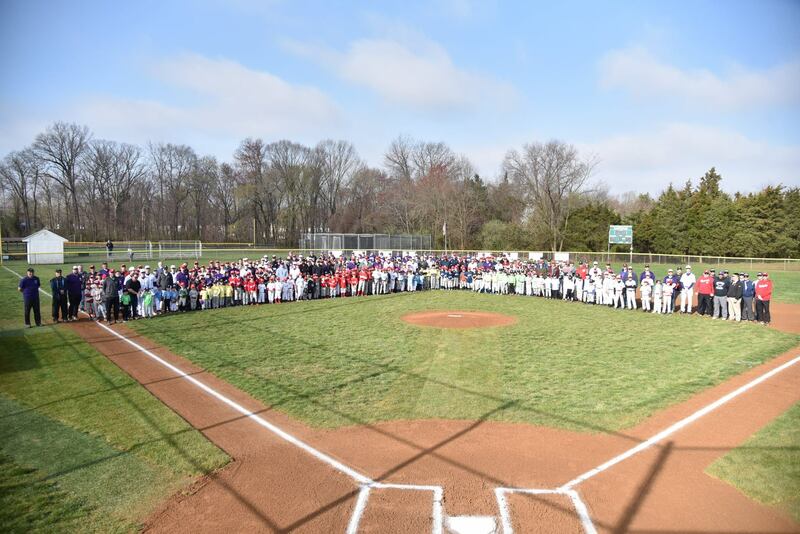 The Oakton Cougar Baseball Camp will utilize Tom Hall field which is the baseball field at Oakton High School. PLEASE ACCESS THE FIELD THRU THE SUTTON ROAD GATE. The Oakton Cougar Baseball Camp is committed to a professional hands-on approach, insuring active participation of each player. We are committed to providing an optimum learning and teaching environment. How is Field Status Determined? If games are moved or canceled due to field closure, you will receive a notification by email (or text if you set your account up for text messages). You can configure your notification settings by signing in, then click on "Edit My Account". Each weekday, the Fairfax County Park Authority (FCPA) determines playability of all Fairfax County Park fields (based on FCPA personnel in-person observations) and posts athletic field status by 3PM. If FCPA closes a field, nobody should use that field and if it has lights, they will not work when park is posted as closed. FCPA does not post field status for Fairfax County Public Schools fields. FCPA does not post status of the field at St Veronica. Sometimes, as full adopters of Chantilly Park, we are allowed to open Chantilly Park when FCPA would normally close it. In the past year, this has been much more difficult to accomplish. If/where/when we can, we will try to check conditions at school fields and StV. We can’t always get out or get someone else to go check a field. On a sunny day, we’re likely to assume the field is in good shape and we’ll post it as open. On a more questionable day, or the day after a field was closed, if nobody has reported to us, we will post the field as “TBD” – so that after 3:15 PM it is up to the managers of the teams scheduled to practice or play. This is also referred to as “Manager Decision” or “Game Time Decision”. We try to update our status by 3PM. It’s safest to wait until about 3:15 to check field status. We're at work during the day, just like you, and aren't always able to check on the fields. One of the best things about the our website is that the field status page is quick and easy to update. The bad thing is we can’t add any text to the page to explain anything and there’s no date/time stamp to know when it was last updated. When possible, we’ll update Facebook and post a message on the front page of the website. Field status may change after 3:15 PM if we get updated reports of field conditions or weather comes in later.. Please keep in mind that just because it’s raining where you work or live, does not mean a field will be closed. TBD - Orange = Before 3:15 PM - field status has not been updated, after 3:15 PM (or on a weekend) it is up to the manager to determine field status. Even when fields are "OPEN" it is everyone's responsibility to assess the condition upon arrival. If the field is not playable, don't step on it. You must be able to rake/drag field and actually do so after use. If it’s too wet, you just cannot rake or drag. Managers – re: “Manager Decision” status, use the guidelines below to determine playability. Use common sense please. All managers are encouraged to assess field conditions upon arrival at any open field. · There is standing water on any portion of the field. · The sound of a footstep (squish-squish) can be heard while walking on the field. · While standing on the field, water can be observed gathering around the sole of the foot. · While walking (not running) across a grass portion of the field, a footprint is left in the soil (not just the grass bending over). · While walking (not running) on any dirt portion of the field, an impression ½” or deeper is made in the soil. DO NOT rake mud or sweep puddles into the grass. DO NOT dig trenches to remove standing water. DO NOT use Turface or any quick-dry material unless you have received authorization to do so. CYA’s Chantilly American tournament team won the Little League Baseball Virginia District 10 Age 9-11 Tournament by defeating Fairfax National 6-5 at Fairfax Burke field on Monday 2 July. 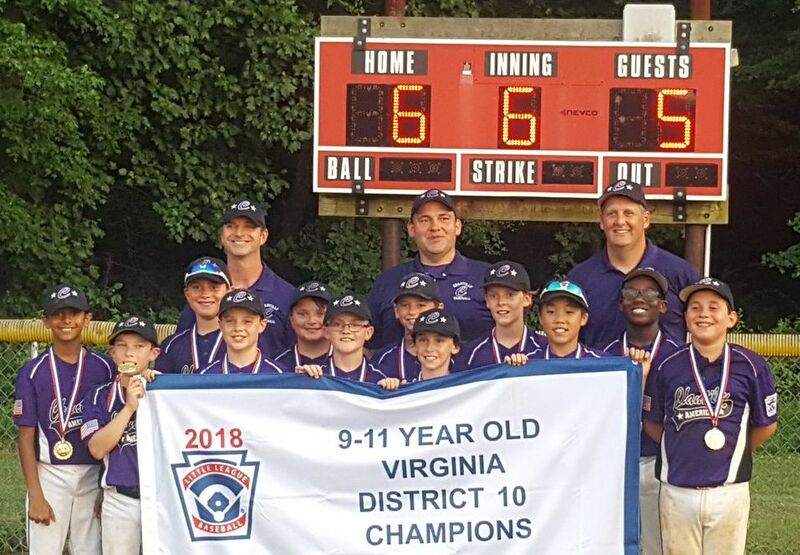 The Chantilly American 9-11 team will now represent LL VA District 10 at the LL Virginia State Tournament in Woodstock, VA beginning 19 July. District 10 Chantilly American won both 9-11 state tournament pool D games and advances to single elimination play Monday 23 July at 1:30 2:00 PM GAME DELAYED 5:30 PM vs District 3 Broadway (from just north of Harrisonburg) at Riverview Park in Woodstock, VA.
7/23/18: D10 Chantilly American defeated D3 Broadway to advance to the state semi-final against D16 Dulles South at 9PM Mon 23 July. 7/23/18: D10 Chantilly American falls 5-3 to D16 Loudoun South. Loudoun South will face D4 Vienna American in the 9-11 State Championship tomorrow. It was a good run. We are proud of you. 7/24/18: Loudoun South wins VA LL 9-11 State Championship. We are thrilled to reopen the Shack for the spring season, and will be operating on Opening Day, April 7. To make sure this happens - we need volunteers! As soon as the schedules are posted, you will receive a link to the SignUp page where you can register to volunteer for a shift on Opening Day, and throughout eh season. Remember, for each child playing in AA, AAA, and Majors, an adult should expect to work at least two shifts during the regular season. To start the season off right, we'll be ready with brewed coffee (no more instant packets!) and...drum roll please...reusable coffee cups with the Chantilly Little League logo on them! After your initial purchase of the cup, each refill will be less than the price of a cup of coffee in a disposable cup with lid (those will still be available). This will reduce our waste, and you'll have a good looking cup to proudly use over and over. These will be available in limited quantities on Opening Day, with additional orders placed as needed. More information on the updated menu and operations of the Shack to come. We look forward to a fun spring season with all of you! During my coaching career, I have had positive relationships with nearly all of my athletes’ parents. The majority of them are so helpful, kind, and supportive of the team and coaches. This post is not meant to give the idea that coaches are perfect. Believe me; I have made more mistakes than I can count. That’s right. We do. My personal favorites are the players that have a great work ethic, are intelligent players, will do whatever it takes to help the team, and of course display athleticism and talent. I know we think if we give our child that one last tip before he goes up to bat, he will surely get that big hit. Unfortunately, this only causes the player to think about something other than the task at hand. This is more detrimental than anything else. Some of my fondest memories of coaching come from players that didn’t start for me. Please realize that most coaches love all of their players. Unfortunately, in life, some people are better at certain things. This does not mean that your child is a failure. It definitely does not mean that coach loves your child less than the starters. In this age of select teams and travel ball burnout has become an issue. The children play way too many games throughout their youth. By the time they get to junior high or high school, they are burned out and do not enjoy the sport. Let’s be honest. The chances of getting a college scholarship are slim. Not impossible, but also not likely for the majority of high school athletes. This is the most common excuse when deciding not to play a sport. “I’m going to focus on _____________”. Whatever sport your child is quitting will actually help them to become a better all-around athlete. The majority of professional and college athletes were multi-sport athletes in high school. They played more than one sport, and look where it got them. 1) If you care more about your child’s statistics or playing time than if the team won or lost. 2) If you treat your child differently after a win or a loss. 3) If you constantly feel the need to undermine a coach because your child is not playing as much as you would like. Failure and dealing with failure are HUGE lessons to learn in life. If you give your child the proper tools to deal with failure in sports, this will greatly benefit him or her in the future. Making excuses or always blaming the coach for your child’s failures is merely setting them up for problems down the road. Everything that goes wrong or doesn’t work out will be somebody else’s fault. 8. Our family members are in the stands while you are bashing "the coach"
This one may bother me most of all. As a three-sport coach, I spend a lot of time away from my amazing wife and daughter. WE have made a sacrifice so that I can pursue my coaching career. That means that my time away from my family is devoted to working with your children to help them become better athletes and most of all better people. The least you can do is know who is around you while you are making these comments. Kyle McBrain is an experienced high school baseball and girls basketball coach. He has 8 years experience coaching baseball and 7 years experience coaching girls basketball at Staunton High School (Staunton, IL). Kyle played two years of baseball at Lewis & Clark Community College and two years at Millikin University. "I am sad to see people not getting it. Not getting the fact that their child or a player taking the field is not properly prepared to do so. Everyone is so interested in playing games and only get satisfaction from playing when they should be focusing on practicing and developing their skills." Major League Baseball and USA Baseball are pleased to offer the Play Ball Mobile Coach Application. Play Ball Mobile Coach, which is free to all users, features the ability for baseball coaches at all levels to plan practices using drills supplied in the application through the practice planning function. The app also includes information related to Pitch Smart, including guidelines, resources, and pitch counting features. Additional tools and resources are also included, and more features will be added over time.